Who is The Sassy Marketer? Since my last post was a bit dark, let’s brighten things up (pun intended) with a fun topic that happens to be one of my not-so-secret passions – color psychology! It may sound fluffy but there’s a lot of hard data out there that proves color use in marketing matters and when used in the right context, colors can (and should) be manipulated to achieve particular outcomes. You would do yourself well to learn how to master the use of this color wheel. 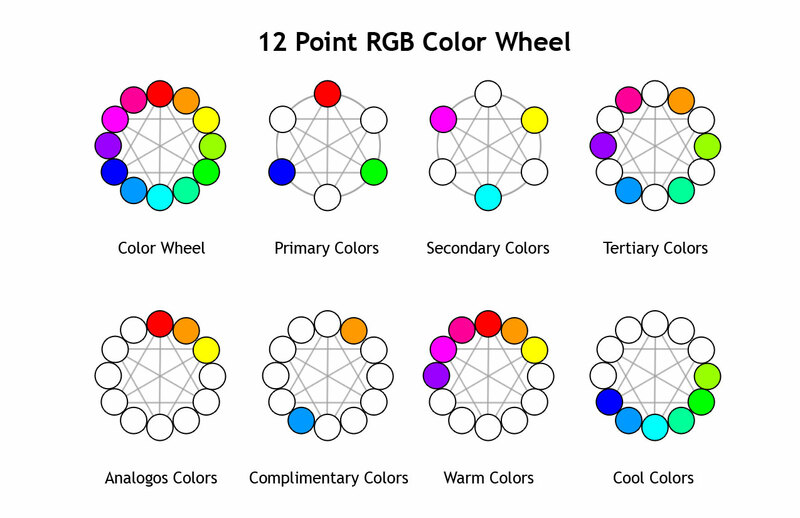 It’s not hard and lucky for you other folks already did the hard work to determine how to use colors for maximum effectiveness. For example, Paul Olyslager does a nice job in this blog concisely explaining how to use complimentary (think opposite) colors to draw the eye to the desired call-to-action (CTA). The idea here is that the contrast of the complimentary color (red) jumps out against the blue background and draws the eye to the preferred CTA, which is of course to sign up. Cool, huh? If you like this and want to learn more about how colors impact conversion check out this post from ConversionXL. Below is a list of colors, which I would like you to read one at a time and after each one, say the first thing that pops into your mind. This works better if you do it out loud. If you’re reading this on a plane or in the office, invite others to play along. Don’t be shy. What’s really interesting about this game is everyone is going to have different answers depending on their current mindset, age, gender, social background and of course, geography. A 20-year-old guy might initially think of “breasts” for the color pink (yep, I said “breasts,” not “breast cancer” – it seems the cancer awareness part gets dropped quite a bit). Whereas a 30-year-old woman with children probably thinks of little girls’ toys and clothing. Similarly, red is a color of power and aggression in America, but in some Asian countries it symbolizes good fortune and wealth. Colors also come into play when considering brand association. You’d probably find it pretty strange and perhaps even off-putting if you got an email from Target with a blue color scheme because we all have learned to associate Target with the color red. When developing marketing materials and selecting colors, you need to consider your intended audience, how they perceive you and the message you’re trying to convey. Most people will choose blue. You might think I chose intentionally gender-polarizing colors, so the preferences would be split, but in fact studies show that in general, women are more averse to pink than men are (there are of course specific contextual exceptions to this, such as when making purchases for female children and donating to charity). Now, which image do you prefer? Most women, and probably many men, will choose image #1 in pink. I mean, the guy in blue is fetching but the guy in pink in downright distracting. You can’t help but look. In all seriousness, though, both images have a quality that draws your attention. 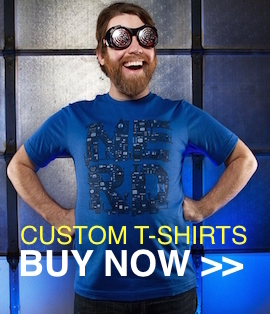 What if I now told you the purpose of this ad is to sell custom t-shirts. 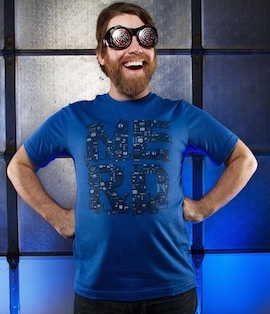 Which makes you want to buy a T-Shirt? My point is, you need to consider not only sentiment about colors but how they’re viewed in context and what they’re intended to do. Oh yeah…and who they’re for (that all-important audience thing again). These principles above are good guidelines to live your marketing life by, but even equipped with these nuggets of brilliance I will encourage you to keep testing your color options. The things that do and do not work may surprise you. A story about the color purple: Not long ago I ran a pretty extensive marketing campaign which was targeted toward an IT audience. The primary imagery and CTAs for the campaign were in purple. Generally, purple and brown are the least successful colors for CTAs, but we had recently used purple very successfully in a campaign targeted at law firms and decided to use it again. It flopped. Badly. We knew the color was the culprit because we saw an increase in click rates when we ran an A/B split test with different button colors: orange and blue were both much more effective. We continue to see good click rates with purple CTAs for the legal industry audience, which just goes to show sometimes you don’t know what works for which audience unless you test. In summary: Colors matter. Context matters. Colors in context can have a material impact on how people perceive and interact (or don’t) with your marketing programs. And never stop testing. ABM: WTF or F*** Yeah!? You’ll never believe how amazing this post about click bait is!! Also mentions Facebook, LinkedIn, Donald Trump, Salesforce Pardot and Google! Has objectivity eclipsed creativity in marketing?